This summer has been one for the books and I don’t want it to end. It’s been packed full of patios, pools, nature, hikes and lounging, especially in one of my favourite places – Harrow, Ontario. Now most of you won’t have any idea where that is, but I was lucky enough to grow up in there. Though I took it for granted for many of those years, I now go back every chance I get. So, if you’re looking for one last fling before leaving your house (and Netflix) is a non-negotiable, I’ve got your perfect end of summer escape all planned. But before I share this hidden gem of place with you, let me give you the low down, on little old Harrow. This is a 2,700-person town, with one traffic light. It’s part of Essex County and is about 3.5 – 4 hours outside of Toronto. We got our first (and only) Tim Hortons about five years ago and most importantly; we are one of the top three wine regions in Ontario. Now that that’s all cleared up, let’s go! 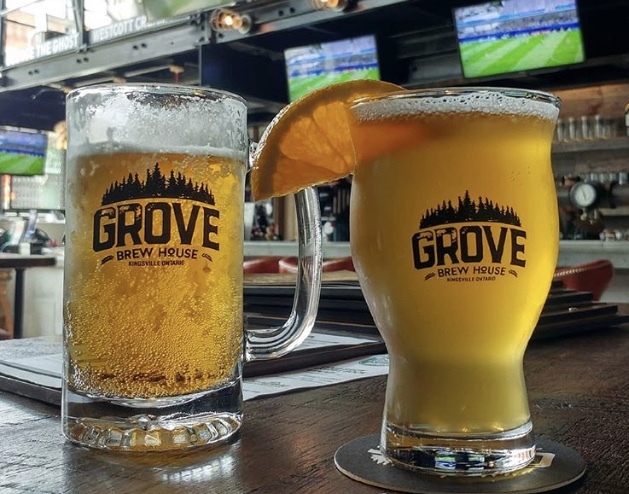 · The Grove - finding a place to stay when you’re headed out on a weekend away is always the first step. With a Drake Devonshire vibe, The Grove will have you oo-ing and ah-ing from the moment you walk through the doors. With various themed rooms to choose from, they’ve got everything from the Brew Master Suite, to the Nothing But Glam and Just Bike It rooms. A room for every style and personality. If that wasn’t enough, this hotel, is a one stop shop, tripling as a place to stay, 10 barrel craft brewery, and restaurant. Technically speaking, if you really want to relax, you never have to leave the hotel. It’s located in the nearby town of Kingsville, 15 minutes away by car. · Oxley winery – though not designed with Instagram in mind, this place is an instagrammers dream. Not only are the buildings and vineyards gorgeous, but the food and wines are unbelievable. Their menu is farm fresh, with lots of gluten free options. If you are going Thursday-Saturday reservations are recommended for dinner. · Paglione Estate – I’m partial to their wines but love their stone oven pizzas, charcuterie boards, and gelato shop. They also get bonus points for having GF pizza and cracker options. · Viewpointe Estate – this one wins the title of most majestic and paired with a great patio and view of the lake, it’s the perfect spot for a wine & relaxation break, after an exhausting day of exploring, eating and drinking. · Erie Shore Winery – this may be one of the smaller wineries in the area but it’s got the most heart. Their wines are critically acclaimed and award winningm, and once you meet owners Harvey and Alma, you’ll see why. Equal parts wine makers and storytellers, I can guarantee you’ll stay for longer than you planned and leave with more than you bargained for. · Wolfhead Distillery – they are the first premier craft distillery in the county and use as much as they can from their own backyard to produce unique vodkas and whiskys. I am a whisky girl but I love their grapefruit vodka. · GL Heritage Brewing Company – built on a century farm, this a small batch brewery that grows their own barley. They do not have gluten free beers but come highly recommended from those around who can digest it! · Farm Dog Cycles – if you’re looking for a way to burn off the calories you’re about to consume, Farm Dog guided (or self-guided) tours are the perfect way to take in the scenery, while exploring the vineyards. And, as an extra added bonus, they are based on a fruit farm that I have been visiting and buying from my whole life. After your wine tour, make sure to grab all the fruits, veggies, home made apple cider vinegars, and flowers you can, before making your way back to the city. · Pelee Island – now you may have heard of the winery, it’s an Ontario staple after all, but it’s also an actual island – surprise! They have two wineries, one is based on the mainland, the other on the island. My suggestion? Grab the ferry, rent some bikes and make it an island adventure day. The winery there has a great snack bar and sweet shop, in addition to offering tastings, tours, and live music on their patio. If you’re looking for a wine reco, my go-to is a rosé, named Lola. · Mettawas Station – this is my go to every time I’m home. I’m obsessed with their gluten free pizzas, Mediterranean salad, seasonal dishes, cocktails and the list goes on. Housed in the old Kingsville train station they have a gorgeous patio, party room, and dinning area that I’ve rarely seen empty. If you’re looking for a delicious dinner, easy atmosphere and great service, this is your places. · Jack’s Gastropub - Every small town has a pub and Jack’s is ours. Walking distance from the Grove Hotel this spot is always busy with locals and tourists milling around. Their wrap around, enclosed porch, complete with blankets for the cooler days and nights is my favourite place to sit. In terms of go to dishes, Jacks is best known for their constantly changing menu, as they strive to always work with local farmers, producers and artisans. · Dairy Freeze – this is our version of Bang Bang or Summers. A cult and county favourite the Dairy Freeze is the OG of soft serve ice cream and old school drive through food. My go-to is either their chocolate dipped cone with nuts or their chocolate milkshake with a side of fries. Essex County isn’t Niagara or PEC. It’s small towns with a lot of charm and character, but most importantly it’s made up of some pretty amazing people that help each other grow. If you want a trip that lets you relax, eat good food, drink great drinks, and meet kind people, Essex County is the place for you.